This post was not written by me... it's a copy and paste from a member on POTN. First and foremost, we need to cover the 3 main settings you should be adjusting on your Digital SLR and the relationship they share with one and other: Aperture, Shutter Speed, and ISO. In the world of photography, light is everything. These 3 settings control how much light enters your camera or how your camera processes that light, so understanding what each setting controls and the relationship between the settings is critical to taking a properly exposed picture. Think of Aperture as the hole in your camera that lets in light. A bigger aperture means a bigger "hole" and thus, lets in more light. Conversely, a smaller aperture will let in less light. Aperture is probably the most confusing of the 3 settings because the number (f/stop) used to describe it may seem "backwards" to most people. The lower the number, the larger the aperture, and vise versa. Aperture is usually controlled in 1/3 stops, so 3 clicks of the wheel is 1 full f/stop. For example, f/2.8 to f/4.0 is one full stop. f/3.3 and f/3.5 would be one third stops in between f/2.8 and f/4.0. The minimum and maximum aperture settings are dependent on the lens you're using. More expensive lenses will usually have bigger apertures. For example, a lens with a maximum aperture of f/2.8 will usually cost hundreds of dollars more than the same lens with a maximum aperture of f/4.0. Aperture doesn't just control the light entering the camera, it also controls what is known as Depth of Field (DoF). This is the primary reason for adjusting the aperture value on the camera and is extremely important to understand. Depth of field is simply a way of describing how much of your picture is in focus. A narrow depth of field will have very little in focus (blurry background) while a wide depth of field will have almost the entire frame in focus (detailed background). Depth of field is controlled by the aperture setting. A larger aperture (smaller number) will have a very narrow depth of field. A smaller aperture (larger number) will have a wide depth of field. For example, in the images above, the left picture was taken at f/10 where as the picture on the right was taken at f/2. A good way to remember this relationship is to think of the aperture f/stops (numbers) as a measurement of depth of field. The smaller the number, the smaller the depth of field, and vise versa. So then, why would we ever want to use a large aperture (small number)? Wouldn't we always want the most detail possible? The short answer is no, because your aperture setting will vary greatly depending on your situation. If you're looking to isolate your subject or remove a distracting background, a narrow depth of field is the best way to do so. Your subject will be in focus and the background will be blurry. Depending on how far away the background is and how large your aperture is, the background can become so blurry that it almost looks milky. This magnitude of background blur is usually referred to as "bokeh" and is a desired effect for some pictures, especially portraits. An example of the exact opposite situation where you'd want maximum detail and a wide depth of field would be shooting a landscape or something very large. In that case, the background actually is your subject, so a blurry background would not be desirable. A large aperture is a small f/stop number (f/1.4, f/2, f/2.8 ). A small aperture is a large f/stop number (f/12, f/18, f/32). 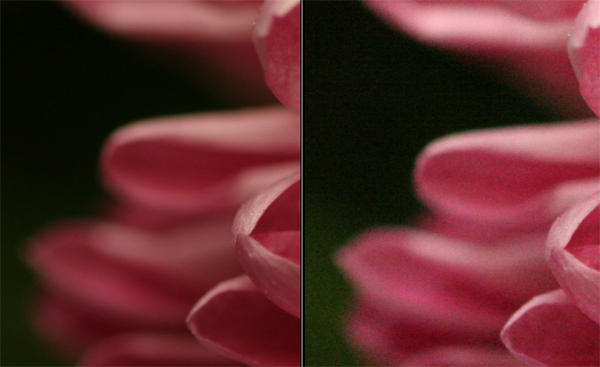 A large aperture will let in more light, but will have a smaller (narrow) depth of field. A small aperture will let in less light, but will have a larger (wide) depth of field. Just like aperture, shutter speed controls how much light enters your camera. Think of the shutter as a door that usually remains closed. When taking a picture, this door opens momentarily and lets light in to the camera. The length of time the shutter stays open is called shutter speed. The slower the shutter speed, the longer the shutter stays open, and vise versa. When the shutter is open longer, more light enters the camera. Similar to aperture, shutter speed is also measured in 1/3 stops. Every 3 clicks of the wheel will double or half the shutter speed. For example, 1/50 to 1/100 is one stop. 1/100 will let in half as much light as 1/50. The one third stops along the way would be 1/60 and 1/80. Thus, when starting at 1/50, 3 ticks of the wheel would get you to 1/100. Aside from letting in light, your shutter speed is used to control motion; both subject motion AND your motion. No human being can ever stay perfectly still, so even with a motionless subject, your motion is equally as important to keep in mind. The longer the shutter is open, the more motion blur will occur. Occasionally motion blur is preferable, but more often than not, accidental motion blur ruins what could have been a great picture. A good rule of thumb is to shoot a motionless subject at or above 1/focal lenth to avoid a blurry picture. 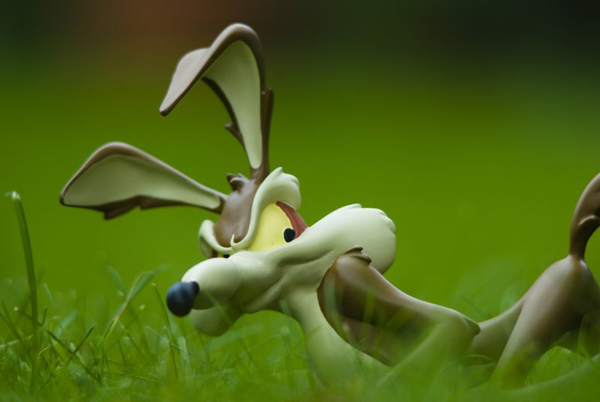 For example, if you're using a 17-55mm lens at 50mm, it's best to shoot at 1/50 of a second or higher to avoid blur. Everyone is different and some people are steadier than others, so if you're particularly steady you may be able to lower the shutter speed a bit, or if you're particularly shaky you may need to increase the shutter speed a bit. Shutter speed is most important when your subject is moving. For example, when shooting a moving car, if the shutter speed is too fast, it will look like the car is standing still. Too slow, and now the car is a giant blur. 1/160 is my preferred setting to catch a little motion blur in the background and to see the wheels spinning, but everyone is different. A good example of how shutter speed can affect your picture can be seen below. This is a waterfall taken at 1, 1/3, 1/30, 1/200, and 1/800 of a second. As you can see, at 1 second, the water looks silky and almost magical. At 1/800 of a second you just see individual water drops. At 1 second you can capture the full motion of the water, at 1/800 you can completely stop or freeze the motion of the water. A slow shutter speed will let in more light, but will increase the chance of motion blur. A fast shutter speed will let in less light, but will decrease the chance of motion blur. ISO is similar to film speed on film cameras. Unlike aperture and shutter speed, ISO doesn't control how much light enters the camera, but instead controls how sensitive the camera is to that light. The lower the ISO, the less sensitive the camera is. In other words, a lower ISO will require more light to properly expose a picture than a higher ISO. Most entry level digital SLR's will have an ISO range from 100 to 1600. More expensive digital SLR's may have ISO 50, 3200, and a select few have 6400. On most cameras, ISO is adjusted in full stops. Only the more expensive cameras will have 1/3 stop adjustments of ISO. In most cases you will be able to adjust your ISO to 100, 200, 400, 800, and 1600. For example, ISO 100 will need twice as much light to expose the same picture as ISO 200. So then, why not just max out the ISO and never worry about light ever again? Unfortunately, ISO comes at a price. Depending on your camera's ISO performance, it can come at a pretty hefty price too. As you increase ISO you are effectively decreasing the quality of your picture. While it's very hard to see a difference between ISO 100 and 200, ISO 800 or higher is extremely noticeable. On most cameras, taking a picture at ISO 1600 is completely worthless. This is caused by the increased sensitivity of higher ISO settings. While increased sensitivity means you can expose a picture with less light, it also means your picture will have more noise (distortion). While a little noise can be acceptable -- especially if you'll be reducing the image size significantly for the web -- too much noise can completely trash a picture. As you can see, the picture on the right suffered from a lot of noise and was pretty much ruined by ISO 1600. For this reason it's important to always shoot at the lowest possible ISO. There will always be situations where it is impossible to shoot at ISO 100, but do your best to keep it to 400 or below for the best results. A lower ISO will produce a higher quality image but requires more light to expose a picture. A higher ISO will produce a lower quality image but requires less light to expose a picture. As you can see, Aperture, Shutter Speed, and ISO are all closely related: they all control light in some way. Understanding how to balance the three is the key to properly exposing a picture. Like anything else, balancing the three settings is all about trade-offs. While it would be wonderful to take a picture with the fastest shutter speed, smallest aperture, and lowest ISO, it's just not possible. 1) Shutter speed: Is the subject moving? Do you want to stop the action or do you want to see motion blur? If so, shutter speed is most important to you. 2) Aperture: Is the background distracting? Do you need to isolate your subject? Are you shooting a landscape? Do you need A LOT of detail? If so, aperture is most important to you. Once you figure out what is most important, you can then play with the remaining settings to properly expose your shot. If shutter speed is most important, set the shutter speed first. Next, select an acceptable aperture. With those settings, can the shot be properly exposed with ISO 100? ISO 200? If you need to bump your ISO to 400 or higher, you might re-evaluate your aperture in this case. Will you still be satisfied with this picture with less depth of field (a bigger aperture)? If so, you can open up your aperture to let in more light, allowing you to use a lower ISO. If aperture is most important, set the aperture first. Do you need a lot of detail in your picture? Set a small (bigger number) aperture. Is your background distracting? Do you want to isolate your subject? Set a big (smaller number) aperture. Next, select an acceptable shutter speed. Just like in the previous example, can this shot be properly exposed with a low ISO? If not, can you reduce your shutter speed to let in more light? If your subject isn't moving and you have a steady hand, the answer would be yes. However, it's never a good idea to reduce your shutter speed to the point where you're risking taking a blurry picture. A little ISO noise is a lot better than a useless blurry picture, so play it safe. You want to take a picture of a flower. Unfortunately, there's a dumpster behind this flower and it's not very attractive. In this situation, aperture is obviously the most important setting. You set your aperture to f/2.8 for maximum bokeh (background blur). Rather than standing back and zooming in, you get very close to the flower to maximize the relative distance between the flower and the background to further ensure maximum bokeh. You set your ISO to 100 for maximum quality. All that's left is setting the shutter speed. Your hand is a bit shaky, so you want to take this picture at 1/100 or faster to make sure its not blurry. Unfortunately, photography is all about trade-offs. It's cloudy outside, and to make things worse, the flower you want to take a picture of is in the shade. At ISO 100 and 1/100 your meter says the shot will be underexposed. You have three options: 1) increase the ISO or 2) decrease the shutter speed or 3) increase the aperture. Well, the aperture is already maxed out at f/2.8, so option 3 is no good. It's freezing cold outside and you're shaking a bit, so reducing the shutter speed below 1/100 is going to risk taking a blurry picture which means option 2 is out too. All that you can do is increase the ISO so you bump it up to ISO 200 which doesn't reduce quality much at all (most people can't even see the difference). At f/2.8, ISO 200, 1/100 the shot is actually just a tad over-exposed because you only need half as much light now. No big deal, just increase the shutter speed a touch; if anything this just means you have some more protection for your shaky hands. At 1/125 the meter shows that the shot is properly exposed and you're ready to take a perfect picture. Now, obviously this is an extreme example. As you get more experienced you won't go through this kind of scenario where you're adjusting your settings 4 or 5 times before finding the right exposure. You'll look at this situation and immediately know that the aperture should be around f/2.8, the shutter should be around 1/100, and ISO should be 200. Then you walk up, flick the shutter speed dial once or twice, and take the picture. The whole process takes less than 5 seconds. I hope this guide has helped you understand Aperture, Shutter Speed, and ISO. If you found it helpful, please post a reply. What exactly is focal length and what does it mean? More importantly, how does it affect you? Technically, focal length is the distance from the lens to the film (or in our case, the sensor). In more useful terms, focal length is how most people would describe "zoom." For example, a focal length of 100mm would appear to be twice as "zoomed in" as a 50mm focal length. While it is true that images appear to be 2x closer in a 100mm focal length vs a 50mm focal length, calling this "zoom" is actually incorrect. So then, what is zoom? Before we can even answer that question, we have to first understand that there are two primary types of lenses for digital SLR's: Prime lenses and Zoom lenses. A prime lens has a single focal length (ex: 50mm). A zoom lens has a minimum focal length and a maximum focal length (ex: 17-55mm) and can use any focal length in between. A prime lens has no zoom at all, which is why referring to a particular focal length compared to another as "zoomed in" or "more zoomed" is incorrect. When comparing a 50mm and 100mm prime lens the proper term to describe the difference would be "reach." The 100mm lens has twice the reach of the 50mm. When looking at the specifications for a Zoom lens you will probably see something like "Optical Zoom" or "Zoom." For example, you might see that a 17-55mm zoom lens has "3.2x" zoom. The proper term for this is actually "Zoom Range" and it simply means that the range between the minimum focal length (zoomed all the way out @ 17mm) and the maximum focal length (zoomed all the way in @ 55mm) is 3.2x. To figure out the "zoom" of any zoom lens, just divide the max focal length by the min focal length. 55 / 17 = 3.2. Canon EF-S 17-55mm f/2.8 -- 55 divided by 17 is 3.2. Thus, this zoom lens has a zoom range of 3.2x. Canon EF 70-200mm f/2.8 -- 200 divided by 70 is 2.9. Thus, this zoom lens has a zoom range of 2.9x. Now, if normal people heard that the first lens had a zoom of "3.2x" and the second lens had a zoom of "2.9x" they'd probably assume that the first lens would let them see further away. However, we know this isn't actually the case because focal length is what determines the "reach" of the lens, the zoom is irrelevant. In the same example above, the 70-200mm would actually have almost 4 times the reach of the 17-55mm. This is because 200mm is almost 4 times longer than 55mm. The best way to understand focal length is to start with a base number that is most relevant to us: the focal length that looks most similar to our natural eye sight. On a full-frame camera (more on this later) 50mm is the closest focal length to our normal eye sight. In other words, if you were to look through a lens at 50mm it would appear as though nothing had changed. Reduce the focal length and things will appear further away. Increase the focal length and things will appear closer. For example, 100mm will appear 2x closer than our normal eye sight. 200mm will appear 4x closer, and so on. On the flip side, 25mm will appear 2x further away, and 12mm will appear 4x further away. People often refer to lenses that are smaller than 35mm as "wide angle" lenses. As I mentioned earlier, all of these numbers refer to "full-frame" cameras. This is because older 35mm film cameras set the standard. Today in the digital age, only a select few digital SLR's are actually "full-frame" such as the Canon 1Ds and Canon 5D. Most digital cameras use a sensor that is considerably smaller than 35mm film. 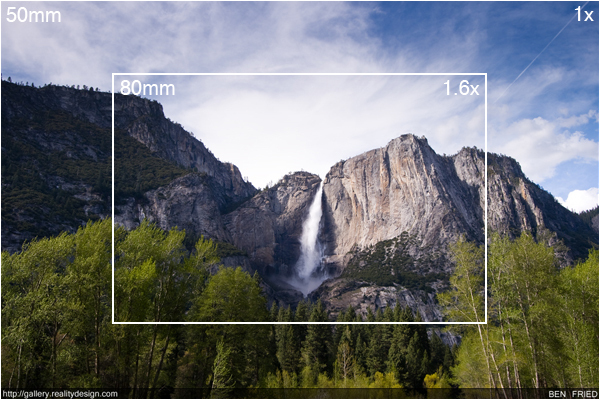 This size difference is known as the "Field of View Crop Factor." Most digital cameras, including the Canon Rebel, XT, XTi, 10D, 20D, 30D, 40D, etc, have a 1.6x crop factor. This is not a bad thing, but it needs to be understood and taken in to account. In fact, a 1.6x crop factor can actually be used to your benefit. Essentially, a "crop-body" camera crops the outside edges of the pictures because the sensor isn't full size. The end result is that the same focal length lens on a "crop-body" camera appears to have more reach than on a full-frame camera. To calculate the effective focal length, just multiply the crop factor by the focal length. For example, a 50mm lens on a crop-body camera has the effective focal length of an 80mm lens on a full-frame camera (50 x 1.6 = 80). What does this mean exactly? It means that any given lens will have 1.6 times the reach on a crop-body camera as it would normally on a full-frame camera. The only down-side of course is that you lose the "wide-angle" ranges as well. A 35mm lens isn't really a "wide-angle" lens on a crop-body camera because its effective focal length is actually 56mm. This of course would normally be bad news for wide-angle users, but Canon now makes special "EF-S" lenses designed specifically for crop-body cameras. The EF-S 10-22mm wide-angle lens from Canon is equivalent to 16-35mm, which is identical to the widest EF lenses Canon makes. In other words, crop-body cameras get the extra 1.6x reach without losing out on the wide-angle end of things. That's about it for focal length! When I have more time I'll write a part 3 to this guide which will discuss White Balance as well as RAW post-processing. Until then, good luck and happy shooting!